Medical educators certainly have their differences, but one still discerns an emerging consensus about the kind of changes that will improve healthcare delivery and simultaneously re-humanize physician-patient encounters. Here are a few of the most progressive trends in medical education, along with brief glosses that serve to recapitulate certain themes of previous postings. It is the patient who must decide the validity of opinion from consideration of its source and probability. If the doctor’s opinion does not seem reasonable, or if the bias of it, due to temperament or personal and professional experience is obvious, then it is well for the patient to get another opinion, and the doctor has no right to be incensed or humiliated by such action. Contemporary medical training stresses the importance of primary care values that are lineal descendants of old-style general practice. This trend grows out of the realization that a physician “can take care of a patient without caring for him,” that the man or woman publicly considered a “good doctor” is invariably the doctor who will “find something in a sick person that aroused his sympathy, excited his admiration, or moved his compassion.” Optimally, commentators suggest, multispecialty and subspecialty groups would retain their own patient-centered generalists – call them, perhaps, “therapeutists” — to provide integrative patient care beyond diagnostic problem-solving and even beyond the conventional treatment modalities of the group. The group-based therapeutist, while trained in the root specialty of his colleagues, would also have specialized knowledge of alternative treatments outside the specialty. He would, for example, supplement familiarity with mainstream drug therapies with a whole-patient, one might say a “wholesome” distrust of drugs. There had been no inquiry of plans or prospects, no solicitude for ambitious or desires, no interest in the spirit of the man whose engine was signaling for gas and oil. That day I determined never to sentence a person on sight, for life or to death. These trends encapsulate the reflections and recommendations of progressive medical educators responsive to the public demand for more humane and humanizing physicians. The trends are also responsive to the mounting burnout of physicians – especially primary care physicians – who, in the cost-conscious, productivity-driven, and regulatory climate of our time, find it harder than ever to practice patient-centered medicine. But are these trends really so contemporary? I confess to a deception. The foregoing paraphrases, quotations, and recommendations are not from contemporary educators at all. They are culled from the popular essays of a single physician, the pioneer neurologist Joseph Collins, all of which were published in Harper’s Monthly between 1924 and 1929. Collins is a fascinating figure. An 1888 graduate of New York University Medical College, he attended medical school and began his practice burdened with serious, sometimes debilitating, pulmonary and abdominal symptoms that had him run the gauntlet of consultant diagnoses – pneumonia, pulmonary tuberculosis, “tuberculosis of the kidney,” chronic appendicitis, even brain tumor. None of these authoritative pronouncements was on the mark, but taken together they left Collins highly critical of his own profession and pushed him in the direction of holistic, collaborative, patient-centered medicine. After an extended period of general practice, he segued into the emerging specialty of neurology (then termed neuropsychiatry) and, with his colleagues Joseph Fraenkel and Pearce Bailey, founded the New York Neurological Institute in 1909. Collins’s career as a neurologist never dislodged his commitment to generalist patient-centered care. Indeed, the neurologist, as he understood the specialty in 1911, was the generalist best suited to treat chronic disease of any sort. Collin’s colorful, multifaceted career as a popular medical writer and literary critic is beyond the scope of this essay. I use him here to circle back to a cardinal point of previous writings. “Patient-centered/relationship-centered care,” humanistic medicine, empathic caregiving, behavioral adjustments to the reality of patients’ rights – these additives to the medical school curriculum are as old as they are new. What is new is the relatively recent effort to cultivate such sensibilities through curricular innovations. Taken together, public health, preventive medicine, childhood vaccination, and modern antibiotic therapy have (mercifully) cut short the kind of experiential journey that for Collins secured the humanistic moorings of the biomedical imperative. Now medical educators rely on communication skills training, empathy-promoting protocols, core-skills workshops, and seminars on “The Healer’s Art” to close the circle, rescue medical students from evidence-based and protocol-driven overkill, and bring them back in line with Collins’s hard-won precepts. It would be a wise thing to devote a part of medical education to the mind of the physician himself, especially as it concerns his patients. For the glories of medical history are the humanized physicians. Science will always fall short; but compassion covereth all. Joseph Collins, “The alienist in court,” Harper’s Monthly, 150:280-286, 1924; Joseph Collins, “A doctor looks at doctors,” Harper’s Monthly, 154:348-356, 1926; Joseph Collins, “Should doctors tell the truth?”, Harper’s Monthly, 155:320-326, 1927; Joseph Collins, “Group practice in medicine,” Harper’s Monthly, 158:165-173, 1928; Joseph Collins, “The patient’s dilemma,” Harper’s Monthly, 159:505-514, 1929. I have also consulted two of Collins’s popular collections that make many of the same points: Letters to a Neurologist, 2nd series (NY: Wood, 1910) and The Way with the Nerves: Letters to a Neurologist on Various Modern Nervous Ailments, Real and Fancied, with Replies Thereto Telling of their Nature and Treatment (NY: Putnam, 1911). Collins, The Way with Nerves, p. 268. Collins’s review of James Joyce’s Ulysses, the first by an American, was published in The New York Times on May 28, 1922. His volume The Doctor Looks at Literature: Psychological Studies of Life and Literature (NY: Doran, 1923) appeared the following year. Collins, “A doctor looks at doctors,” p. 356. Collins’s injunction is exemplified in “The Healer’s Art,” a course developed by Dr. Rachel Naomi Remen over the past 22 years and currently taught annually in 71 American medical colleges as well as medical colleges in seven other countries. See David Bornstein, “Medicine’s Search for Meaning,” posted for The New York Times/Opinionator on September 18, 2013 (http://opinionator.blogs.nytimes.com/2013/09/18/medicines-search-for-meaning/?_r=0). Copyright © 2013 by Paul E. Stepansky. All rights reserved. My late father, William Stepansky, was the most empathic caregiver I have ever known. Until recently, however, I never thought of him that way. Indeed, I never had the sense that he “practiced” medicine one way or another, simply that he lived out his medical calling. I thought nothing of having a father who taped the Hippocratic Oath to his dresser and read it every morning. My father’s “empathy” did not grow out of medical training; it was the stuff of life experience. His family’s emigration from Russia followed the Hitler-like savagery of the Ukrainian Pogroms that followed World War I. Anti-Semite thugs murdered his grandfather on his own doorstep several years before his father, Pincus, mother, Vittie (then pregnant with him), and older sister, Enta began their uncertain journey to America in 1921. Pincus, a highly decorated Russian war veteran, a member of the 118th (Shuiskii) Infantry Regiment of the 30th Infantry Division, was the recipient of what my father termed the Russian equivalent of our own Congressional Medal of Honor. “He was a sergeant,” he would tell me, “but a colonel had to salute him first.” On the battlefield he was wounded three times in the chest and once left for dead. Stripped of his decorations by the bandits who raided his native village of Stavishche, he arrived in the new world penurious and crippled with chest pain. My father, who was born in Kishinev, Rumania during the first leg of his family’s 1,900-mile journey across continental Europe, was six-months old when they arrived in Boston Harbor. A year later, they left Boston and made their home in the densely Jewish enclave in South Philadelphia. Throughout my life, my father shared two memories of his own father; they attest, respectively, to the positive and negative poles of the wounded soldier-tailor’s dedication to high culture. The first is of Pincus gamely limping across long city blocks with his young son in tow; he was taking his young son, my father, to his weekly violin lesson with his first teacher, the local postman. Pincus never left the music room, and when the lesson was over, he took his son’s violin and lovingly wiped it down with a special cloth brought solely for that purpose. The second memory is of Pincus imperiously ordering his son to bring his violin and perform whenever neighbors, friends, or relations gathered in the family’s small apartment. A shy, retiring child, my father urgently wanted not to play. But his father’s directives were issued from on high with military-like peremptoriness that brooked neither contradiction nor delay. And so my father got his violin and he played, perhaps through tears, perhaps through rage. My father, at age 15, watched his father die of heart disease. In February, 1943, having completed his third-year of pharmacy training, he was called up by the army and served as a surgical technician in a medical battalion attached to the 80th Infantry Division of Patton’s Third Army. In France, Belgium, and Germany, he worked alongside battlefield surgeons who fought to keep wounded GIs alive in a surgical clearing company only a short remove from the front line. I learned a bit about the visceral reality of wound management in the European Theatre during his final years, when I interviewed him and several of his surviving comrades for The Last Family Doctor. The prosaic summary of his duties in his army discharge of January, 1946 – “Removed uncomplicated cases of shrapnel wounds, administered oxygen and plasma, sterilized instruments, bandages, clothing, etc. Gave hypodermic injections and performed general first aid duties” – only hints at this reality. My father, so I learned, held down wounded GIs for anesthesia-less suturing, assisted with frontline battlefield surgery, much of which involved amputation, and then, after the day’s work, went outside to bury severed arms and legs. He experienced close fighting in the woods of Bastogne during the freezing winter of 1945, when the techs worked 20-hour shifts to keep up with the inflow of casualties. One can only wonder at the impact of such things on the constitution of a gentle and soft-spoken 22-year-old pharmacy student whose passion, before and after the war, was the violin, and who carried Tolstoy’s War and Peace in his backpack throughout his European tour. A different man might have emerged from my father’s childhood and wartime experience emotionally constricted, withdrawn, intimidated by authority figures or, obversely (or concurrently) enraged by them. In my father’s case, a lifelong performance anxiety – the legacy of a militaristic father repeatedly ordering him to play violin before visitors — was vastly counterbalanced by an enlarged empathic sensibility that enabled him to understand and contain his patients’ anxieties about their health, their relationships, their ability to love and to work. Wrestling as he did with his own anxieties and memories of the war, which included the liberation of Dachau and Buchenwald, he became a physician who accepted utterly his patients’ prerogative to share their anxieties with him, even to project their anxieties into him. He was, after all, their doctor. My father was not only an astute diagnostician but also a gifted psychotherapist, and the amalgam of these twin talents was an ability to titrate his disclosures, to tell patients what they needed to know, certainly, but in a manner he thought they could bear. His psychologically attuned approach to patient care is now associated with the paternalism of a different era. But it was also an aspect of his ability, rare among physicians, to diagnose suffering and to discern the limits of this or that patient’s ability to cope with it. This style of practice was wonderfully appreciated by his patients, some of whom, after leaving the area, travelled a distance for yearly appointments with him. No doubt they wanted to experience the “holding environment” of his person. Premed students who grind away at biology and chemistry have no idea what my father and his cohort of war-tested physicians, many first- and second-generation immigrants, overcame for the privilege of studying medicine. I would not wish his life story – of which I relate only a few particulars here – on any of them. And yet, we might ponder the desirability of subjecting premed students to some muted version of his experience in order to nurture whatever elements of empathic temperament they possess. Specifically, medical educators can take steps to ensure that premeds are not subverted by medicine’s “hidden curriculum” – its institutional pull away from patient-centered values and practices – while they are still in college, especially when they complete their med school applications and present for their interviews. And they can work harder to find clinical teachers who do not endorse shame, humiliation, and intimidation as credible educational strategies for acculturating young doctors into the profession. My father and his cohort of med students who trained during and shortly after WWII were resistant to shaming and intimidation. They had experienced too much to be diverted from a calling to practice medicine. But then their teachers too had experienced a great deal, many working alongside their future students – the pharmacists, medics, techs, and GIs – in casualty clearing stations, field hospitals, VA hospitals, and rehab facilities in Europe and America. Teachers emerging from the war years encountered a generation of mature students whose wartime experience primed them to embrace medicine as patient care. And the students, for their part, encountered teachers whose own wartime experience and nascent cold war anxieties tempered budding Napoleonic complexes. High tech medicine, bioethics, and patient rights all lay in the future. Generalists like my father were trained to provide care that was caring; their ministrations were largely “medicinal, manual, and mentalistic, which is to say, psychological.” In the kind of training they received, the notion of castigating as “unprofessional” med students whose patient-centered concerns and queries slowed down the breakneck pace of team rounds – a documented reality these days – would literally have been non-sensical. But that was then and this is now. Today medical culture has in key respects become subversive of the ideals that drew my father and his cohort to medicine. And this culture, which revolves around the sacrosanctity of an academic hierarchy that, inter alia, insists on perfection, denigrates uncertainty, privileges outcome over process, and, in the clinical years, engages students adversarially, is far too entrenched to be dislodged with manifestos, position papers, and curricular reforms. What educators can do is seek out medical students whose empowerment derives less from high grades and artfully constructed admissions essays and more from life experience in the trenches – in any trenches. We don’t need to send premeds off to war to make them resistant to the hidden curriculum, but we should encourage premed experience robust enough to deflect its pull and let those of caring temperament develop into caring physicians. Perhaps we need students who are drawn less to biochemistry than to the vagaries of human chemistry, students who have already undertaken experiential journeys that bring into focus the humanistic skyline of their medical horizons. What Coulehan terms “socially relevant service-oriented learning” should not be confined to residency training. We need more students who come to medicine after doing volunteer work in developing nations; fighting for medical civil rights; staffing rural and urban health clinics; and serving public health internships. And if this suggestion is quixotic, let’s at least have premed students spend the summer before senior year in the trenches, as I proposed in “The Hunt for Caring Med Students.” Such strategies will not create empathic caregivers de novo, but they will nurture the empathic temperament of those so endowed and, one hopes, fortify them a little better against the careerist blandishments of the hidden curriculum. It would be nice if, a generation hence, other sons (and daughters) could write about their fathers’ (and mothers’) special kind of therapeutic empathy. E. J. Cassell, “Diagnosing suffering: a perspective,” Ann. Intern. Med., 131:531-534, 1999. J. White, et al., “’What do they want me To say?’: the hidden curriculum at work in the medical school selection process: a qualitative study,” BMC Med. Educ., 12:1-9, 2012; U. H. Lindström, et al., “Medical students’ experiences of shame in professional enculturation,” Med. Educ., 45:1016-1024, 2011; A. H. Brainard & H. C. Brislen, “Learning professionalism: a view from the trenches,” Acad. Med., 82:1010-1014, 2007; P. Haidet & H. F. Stein, “The role of the student-teacher relationship in the formation of physicians,” J. Gen. Intern. Med., 21:S16-20, 2006; Mary Seabrook, “Intimidation in medical education: students’ and teachers’ perspectives,” Stud. Higher Educ., 29:59-74, 2004. Haidet & Stein, “Role of the student-teacher relationship”; N. Ratanawongsa, et al., “Residents’ perceptions of professionalism in training and practice: barriers, promoters, and duty hour requirements,” J. Gen Intern. Med., 21:758-763, 2006; J. Coulehan, “Today’s professionalism: engaging the mind but not the heart,” Acad. Med., 80:892-898, 2005; B. Maheux, et al., “Medical faculty as humanistic physicians and teachers: the perceptions of students at innovative and traditional medical schools, Med. Educ., 34:630-634, 2000; J. H. Burack, et al., Teaching compassion and respect: attending physicians’ responses to problematic behaviors,” J. Gen. Intern. Med., 14:49-55, 1999. See further Burack, “Teaching compassion and respect,” p. 54. M. Marinker, “Myth, paradox and the hidden curriculum,” Med. Educ., 31:293-298, 1997, quoted at p. 293; cf. Haidet & Stein, “Role of student-teacher relationship,” p. 3: “The relational processes of the hidden curriculum assure the perpetuation of its content” (authors’ emphasis). P. E. Stepansky, The Last Family Doctor: Remembering My Father’s Medicine (Keynote, 2011), p. 114. Brainard & Brislen, “Learning professionalism,” p. 1011. Coulehan, “Today’s professionalism,” p. 896. For examples of such physicians and their role in the revitalization of primary care medicine in the 1970s, see Stepansky, Last Family Doctor, pp. 130-133. In the nineteenth century, no one was devising courses, workshops, or coding schemes to foster empathic care-giving. In both Europe and America, students were expected to learn medicine’s existential lessons in the manner they long had: through mastery of Latin and immersion in ancient writings. This fact should not surprise us: knowledge of Latin was the great nineteenth-century signpost of general knowledge. It was less an index of education achieved than testimony to educability per se. As such, it was an aspect of cultural endowment essential to anyone aspiring to a learned profession. I have written elsewhere about the relationship of training in the classics to medical literacy throughout the century. Here I focus on the “felt” aspect of this cultural endowment: the relationship of classical training to the kind of Humanitas (humanity) that was foundational to empathic caregiving. For Lawrence, classical learning signified the gentleman-physician’s association of bedside practice with the breadth of wisdom associated with general medicine; as such, it left them “immune from sins begotten by the narrowness of specialization.” In America, I believe, the situation was different. Here the classics did not (or did not only) sustain an older generation intent on dissociating scientific advance from clinical practice. Rather, in the final decades of the century, the classics sustained the most progressive of our medical educators in their efforts to resist the dehumanization of sick people inherent in specialization and procedural medicine. Medical educators embraced experimental medicine and laboratory science, to be sure, but they were also intent on molding physicians whose sense of professional self transcended the scientific rendering of the clinical art. Seen thusly, the classics were more than a pathway to the literacy associated with professional understanding and communication; they were also a humanizing strategy for revivifying the Hippocratic Oath in the face of malfunctioning physiological systems and diseased organs. Consider the case of Johns Hopkins Medical College, which imported the continental, experimental model to theUnited States and thereby became the country’s first modern medical school in 1892. In the medical value assigned to the classics, three of Hopkins’ four founding fathers were second to none. William Welch, the pathologist who headed the founding group of professors (subsequently known as “The Big Four”), only reluctantly began medical training in 1872, since it meant abandoning his first ambition: to become a Greek tutor and ultimately a professor of classics at his alma mater, Yale University. Welch’s love of the classics, especially Greek literature and history, spanned his lifetime. “Everything that moves in the modern world has its roots in Greece,” he opined in 1907. William Osler, the eminent Professor of Medicine who hailed from the Canadian woodlands north of Toronto, began his education as a rambunctious student at the Barrie Grammar School, where he and two friends earned the appellation “Barrie’s Bad Boys.” On occasion, the little band would give way to “a zeal for study” that led them after lights-out to “jump out of our dormitory window some six feet above the ground and study our Xenophon, Virgil or Caesar by the light of the full moon.” Osler moved on to the Trinity College School where, in a curriculum overripe with Latin and the classics, he finished first in his class and received the Chancellor’s Prize of 1866. Two years later, he capped his premedical education at Trinity College with examination papers on Euclid, Greek (Medea and Hippolytus), Latin Prose, Roman History, Pass Latin (Terence), and Classics (Honours). Ever mindful of his classical training, Osler not only urged his Hopkins students “to read widely outside of medicine,” but admonished them to “Start at once a bed-side library and spend the last half hour of the day in communion with the saints of humanity,” among whom he listed Plutarch, Marcus Aurelius, Plato, and Epictetus. When Howard Kelly, the first Hopkins Professor of Gynecology and arguably the foremost abdominal surgeon of his time, began college in 1873, he was awarded the Universityof Pennsylvania’s matriculate Latin Prize for his thesis, “The Elements of Latin Prose Composition.” Kelly, like Welch and Osler, was a lifetime lover of the classics, and he relished summer vacations, when he could “catch up on his Virgil and other classics. In the early twentieth century, Latin, no less than high culture in general, fell by the wayside in the effort to create modern “scientific” doctors. By the 1920s, medical schools had assumed their modern “corporate” form, providing an education that was standardized and mechanized in the manner of factory production. “The result of specialization,” Kenneth Ludmerer has observed, “was a crowded, highly structured curriculum in which subjects were taught as a series of isolated disciplines rather than as integrated branches of medicine.” Absent such integration, the very possibility of a holistic grasp of sick people, enriched by study of the classics, was relinquished. The elimination of Latin from the premed curriculum made eminently good sense to twentieth-century medical educators. But it was not only the language that went by the wayside. Gone as well was familiarity with the broader body of myth, literature, and history to which the language opened up. Gone, that is, was the kind of training that sustained holistic, perhaps even empathic, doctoring. When in the fall of 1890 – a year after the opening of Johns Hopkins Hospital – Osler and Welch founded the Johns Hopkins Hospital Historical Club, it was with the explicit understanding that medical history, beginning with the Hippocratic and Galenic writings, was a humanizing building block in the formation of a medical identity. The first year of monthly meetings was devoted exclusively to Greek medicine, with over half of 15 presentations dealing with Hippocrates. Osler’s two talks dealt, respectively, with “The Aphorisms of Hippocrates” and “Physic and Physicians as Depicted in Plato.” Over the next three years, the Club’s focus broadened to biography, with Osler himself presenting essays on seven different American physicians, John Morgan, Thomas Bond, Nathan Smith, and William Beaumont, among them. His colleagues introduced the club to other medical notables, European and American, and explored topics in the history of the specialties, including the history of trephining, the history of lithotomy in women, and the ancient history of rhinoscopy. The collective delving into history of medicine that took place within the Hopkins Medical History Club not only broadened the horizons of the participates, residents among them. It also promoted a comfortable fellowship conducive to patient-centered medicine. The Hopkins professors and their occasional guests were not only leading lights in their respective specialties, but Compleat Physicians deeply immersed in the humanities. Residents and students who attended the meetings of the Club saw their teachers as engaged scholars; they beheld professors who, during the first several years of meetings, introduced them, inter alia, to “The Royal Touch for Scrofula in England,” “The Medicine of Shakespeare,” “The Plagues and Pestilences of the Old Testament,” and “An Old English Medical Poem by Abraham Cowley.” Professors familiar with doctor-patient relationships throughout history were the very type of positive role models that contemporary medical educators search for in their efforts to counter a “hidden curriculum” that pulls students away from patient-centered values and into a culture of academic hierarchies, cynical mixed-messages, and commercialism. Medical history clubs were not uncommon in the early decades of the twentieth century. The Hopkins Club, along with the New York-based Charaka Club founded in 1899, had staying power. In 1939, the third meeting of the Hopkins Club, which presented a play adapted by Hopkins’ medical librarian Sanford Larkey from William Bullein’s “A Dialogue Against the Fever Pestilence” (1564), drew a crowd of 460. The following year, when the Hopkins Club celebrated its fiftieth anniversary, Baltimore alone boasted two other medical history clubs: the Osler Society of the Medical and Chirurgical Faculty of the State of Maryland and the Cordell Society of the University of Maryland. Although medical history clubs are a thing of the past, we see faint echoes of their milieu in contemporary medical student and resident support groups, some modeled on the Balint groups developed by Michael and Enid Balint at London’s Tavistock Clinic in the 1950s. All such groups seek to provide a safe space for shared reflection and self-examination in relation to physician-patient relationships. In the late-nineteenth and early-twentieth centuries, history clubs filled this space with topics in medical history. Their meetings broadened the care-giving sensibility of young physicians by exposing them to pain and suffering, to plagues and pestilences, far beyond the misery of everyday rounds. Medical history and the broadened “medical self” it evokes and nurtures – now there’s a pathway to empathy. P. E. Stepansky, “Humanitas: Nineteenth-Century Physicians and the Classics,” presented to the Richardson History of Psychiatry Research Seminar, Weill Cornell Medical College, New York, NY, October 3, 2007. C. Lawrence, “Incommunicable knowledge: science, technology and the clinical art in Britain, 1850-1914,” J. Contemp. Hist., 20:503-520, 1985, quoted at pp. 504-505, 507. S. Flexner & J. T. Flexner, William Henry Welch and the Heroic Age of American Medicine (Baltimore: Johns Hopkins University Press, 1968 ), pp. 63-65, 419-420; H. Cushing, The Life of Sir William Osler (London: Oxford University Press, 1940), pp. 25, 39, 52. W. Osler, Aequanimitas, with other Addresses to Medical Students, Nurses and Practitioners of Medicine, 3rd edition (New York: McGraw-Hill, 1906), pp. 367, 463; L. F. Barker, Time and the Physician (New York: Putnam, 1942), p. 86. A. W. Davis, Dr. Kelly of Hopkins: Surgeon, Scientist, Christian (Baltimore: Johns Hopkins University Press, 1959), pp. 17, 21. David Linn Edsall, who, as Dean of Harvard Medical School and of the Harvard School of Public Health during the 1920s, engineered Harvard’s progressive transformation, entered Princeton the same year (1887) Cushing entered Yale. Edsall came to Princeton “a serious-minded young classicist” intent on a career in the classics. See J. C. Aub & R. K. Hapgood, Pioneer in Modern Medicine: David Linn Edsall of Harvard (Cambridge: Harvard Medical Alumni Association, 1970), p. 7. On Cushing and the classics, see E. H. Thomson, Harvey Cushing: Surgeon, Author, Artist (New York: Schuman, 1950), p. 20. K. M. Ludmerer, Learning to Heal: The Development of American Medical Education (New York: Basic Books, 1985), pp. 256-57, 262. V. A. McKusick, “The minutes of the Johns Hopkins medical history club, 1890 to 1894,” Bull. Hist. Med., 27:177-181, 1953. F. W. Hafferty, “Beyond curriculum reform: confronting medicine’s hidden curriculum,” Acad. Med., 73:403-407, 1998; J. Coulehan, “Today’s professionalism: engaging the mind but not the heart,” Acad. Med., 80:892-898, 2005; P. Haldet & H. F. Stein, “The role of the student-teacher relationship in the formation of physicians: the hidden curriculum as process,” J. Gen. Int. Med., 21(suppl):S16-S20, 2005; S. Weissman, “Faculty empathy and the hidden curriculum” [letter to the editor], Acad. Med., 87:389, 2012. O. Temkin, “The Johns Hopkins medical history club,” Bull. Hist. Med., 7:809, 1939; W.R.B., “Johns Hopkins medical history club,” BMJ, 1:1036, 1939. K. M. Markakis, et al., “The path to professionalism: cultivating humanistic values and attitudes in residency training,” Acad. Med., 75:141-150, 2000; M. Hojat, “Ten approaches for enhancing empathy in health and human services cultures,” J. Health Hum. Serv. Adm., 31:412-450, 2009; K. Treadway & N. Chatterjee, “Into the water – the clinical clerkships,” NEJM, 364:1190-1193, 2011. On contemporary Balint groups, see A. L. Turner & P. L. Malm, “A preliminary investigation of Balint and non-Balint behavioral medicine training,” Fam. Med., 36:114-117,2004; D. Kjeldmand, et al., “Balint training makes GPs thrive better in their job,” Pat. Educ. Couns., 55:230-235, 2004; K. P. Cataldo, et al., “Association between Balint training and physician empathy and work satisfaction,” Fam. Med., 37:328–31, 2005. To which I reply: Will wonders never cease? We’re going to help medical schools make humanistic doctors with better people skills by making sure premed students are exposed to humanistic medicine as it filters through introductory psychology and sociology courses. Had AACP personnel perused a sampling of introductory psychology and sociology syllabi, they might have paused before deciding to cultivate this new skill set through introductory social science courses, which, in this day and age, devote little time to theories of personality, family structure and dynamics, psychosocial development, and psychodynamics – the very topics that engaged me when I studied introductory psychology in the fall of 1969. Still less do today’s introductory social science courses permit psychosocial and ethical consideration of health-related issues; for the latter, one seeks out upper-class courses in medical sociology, medical anthropology, and, of course, medical ethics. If it’s a matter of choosing general nonscience courses that frame some of the ethical and cross-cultural (and racial and gender-related) issues tomorrow’s physicians will face, introductory philosophy courses in moral philosophy and/or ethics would be far more to the point. But I am a historian and my own bias is clear: At the top of horizon-broadening and humanizing courses would be surveys of nineteenth- and twentieth-century medicine in its cultural, political, and institutional aspects. I offer two such seminars to upper-class history majors at my university under the titles “Medicine and Society: From Antebellum America to the Present” and “Women, Their Bodies, Their Health, and Their Doctors: America, 1850 to the Present.” Both seminars address doctor-patient relationships over the past two centuries, a topic at the heart of the social history of medicine. But let’s face it. Requiring premed students to take a few additional courses is a gesture – something more than an empty gesture but still a weak gesture. There is every reason to believe that students who spend their undergraduate years stuffing their brains with biology, organic chemistry, and physics will approach the social science component of premed studies in the same task-oriented way. The nonscience courses will simply be another hurdle to overcome. Premed students will take introductory psychology and sociology to learn what they need to know to do credibly well on the MCATs. And, for most of them, that will be that. Premed education will continue to be an intellectual variant of survivor TV: making the grade(s), surviving the cut, and moving on to the next round of competition. The overhaul of the MCAT is premised on the same fallacy that persuades medical educators they can “teach” empathy to medical students through dramatizations, workshops, and the like. The fallacy is that physicianly caring, especially caring heightened by empathy, is a cognitive skill that can be instilled through one-time events or curricular innovations. But empathy cannot be taught, not really. It is an inborn sensibility associated with personality and temperament. It is not an emotion (like rage, anger, joy) but an emotional aptitude that derives from the commensurability of one’s own feeling states with the feeling states of others. The aptitude is two-fold: It signifies (1) that one has lived a sufficiently rich emotional life to have a range of emotions available for identificatory purposes; and (2) that one is sufficiently disinhibited to access one’s own emotions, duly modulated, to feel what the patient or client is feeling in the here and now of the clinical encounter. Empathy does not occur in a vacuum; it always falls back on the range, intensity, and retrievability of one’s own emotional experiences. For this reason, Heinz Kohut, who believed empathy was foundational to the psychoanalytic method, characterized it as “vicarious introspection,” the extension of one’s own introspection (and associated feelings) to encompass the introspection (and associated feelings) of another. If one seeks to mobilize a preexisting aptitude for empathic care giving, there are much better ways of doing it than adding introductory psychology and sociology courses to the premed curriculum. Why not give premed students sustained contact with patients and their families in settings conducive to an emotional connection. Let’s introduce them to messy and distressing “illness narratives” in a way that is more than didactic. Let’s place them in situations in which these narratives intersect with their own lived experience. To wit, let’s have all premed students spend the summer following their junior year as premed volunteers in one of three settings: pediatric cancer wards; recovery and rehab units in VA hospitals; and public geriatric facilities, especially the Alzheimer’s units of such facilities. I recommend eight weeks of full-time work before the beginning of senior year. Routine volunteer duties would be supplemented by time set aside for communication – with doctors, nurses, and aids, but especially with patients and their families. Students would be required to keep journals with daily entries that recorded their experience – especially how it affected (or didn’t affect) them personally and changed (or didn’t change) their vision of medicine and medical practice. These journals, in turn, would be included with their senior-year applications to medical school. Alternatively, the journals would be the basis for an essay on doctor-patient relationships informed by their summer field work. I mean, if medical educators want to jumpstart the humane sensibility of young doctors-to-be, why not go the full nine yards and expose these scientifically minded young people to aspects of the human condition that will stretch them emotionally. Emotional stretching will not make them empathic; indeed, it may engender the same defenses that medical students, especially in the third year, develop to ward off emotional flooding when they encounter seriously ill patients. But apart from the emotions spurred or warded off by daily exposure to children with cancer, veterans without limbs, and elderly people with dementias, the experience will have a psychoeducational yield: It will provide incoming med students with a broadened range of feeling states that will be available to them in the years ahead. As such, their summer in the trenches will lay a foundation for clinical people skills far more durable that what they can glean from introductory psychology and sociology texts. Those premed students of caring temperament will be pulled in an “empathic” direction; they will have an enlarged reservoir of life experiences to draw on when they try to connect with their patients during medical school and beyond. Those budding scientists who are drawn to medicine in its research or data-centric “managerial” dimension will at least have broadened awareness of the suffering humanity that others must tend to. Rather than reaching for the grand prize (viz., a generation of empathic caregivers), the AAMC might lower its sights and help medical schools create physicians who, even in technologically driven specialties and subspecialties, evince a little more sensitivity. In their case, this might simply mean understanding that many patients need doctors who are not like them. A small victory is better than a Pyrrhic victory. Elisabeth Rosenthal, “Molding a New Med Student,” Education/Life Supplement, New York Times, April 15, 2012, pp. 20-22. Lon J. Van Winkle, Nancy Fjortoft, & Mohammadreza Hojat, “Impact of a Workshop About Aging on the Empathy Scores of Pharmacy and Medical Students,” Amer. J. Pharmaceut. Ed., 76:1-5, 2012. Sarah E. Wilson, Julie Prescott, & Gordon Becket, “Empathy Levels in First- and Third-Year Students in Health and Non-Health Disciplines,” Amer. J. Pharmaceut. Ed., 76:1-4, 2012. Eric R. Marcus, “Empathy, Humanism, and the Professionalization Process of Medical Education,” Acad. Med., 74:1211-1215, 1999; Mohammadreza Hojat, et al., “The Devil is in the Third Year: A Longitudinal Study of Erosion of Empathy in Medical School,” Acad. Med., 84:1182-1191, 2009. Beverly Woodward, “Confidentiality, Consent and Autonomy in the Physician-Patient Relationship,” Health Care Analysis, 9:337-351, 2001. One limitation of such critiques is the failure to recognize that all “toys” are not created equal. Some new toys become old toys, at which point they cease being toys altogether and simply become part of the armamentarium that the physician brings to the task of physical examination and diagnosis. For example, we have long since stopped thinking of x-ray units, EKG machines, blood pressure meters (i.e., sphygmomanometers), and stethoscopes as “new toys” that militate against the acquisition of hands-on clinical skill. But it was not always so. When x-rays became available in 1896, clinical surgeons were aghast. What kind of images were these? Surely not photographic images in the reliably objectivistic late-nineteenth century sense of the term. The images were wavy, blurry, and imprecise, vulnerable to changes in the relative location of the camera, the x-ray tube, and the object under investigation. That such monstrously opaque images might count as illustrative evidence in courts of law, that they might actually be turned against the surgeon and his “expert opinion” – what was the world coming to? 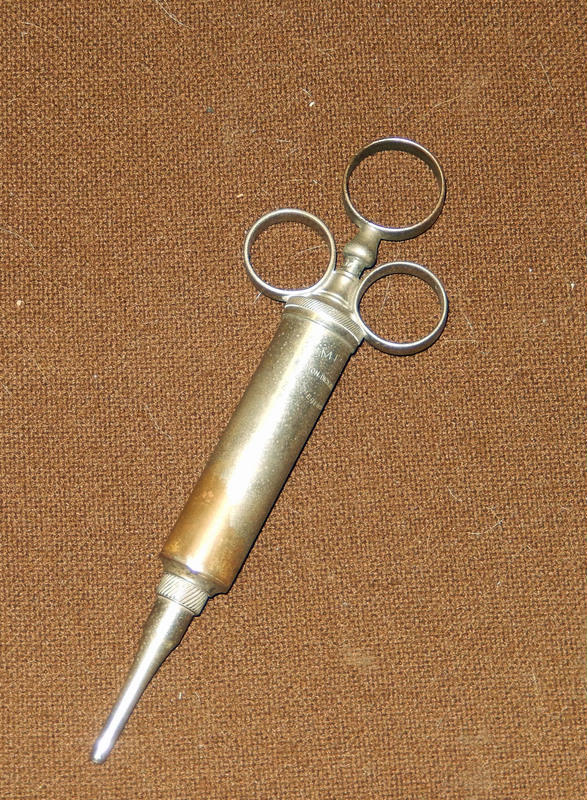 Military surgeons quickly saw the usefulness of x-rays for locating bullets and shrapnel, but their civilian colleagues remained suspicious of the new technology for a decade or more after its invention. No fools, they resorted to x-rays only when they felt threatened by malpractice suits. Well before the unsettling advent of x-ray photography, post-Civil War physician-educators were greatly concerned about the use of mechanical pulse-reading instruments. 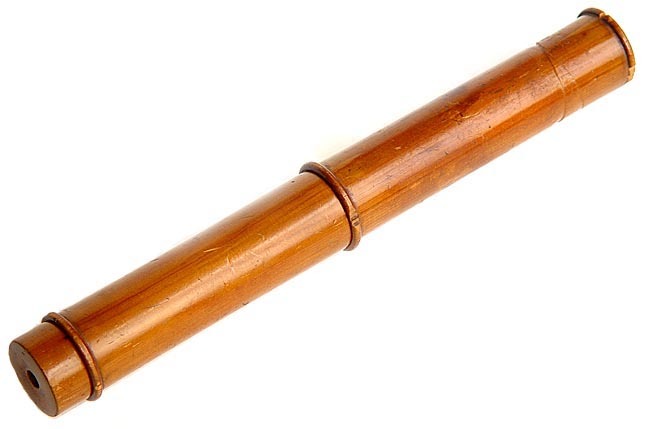 These ingenious devices, so they held, would discourage young physicians from learning to appreciate the subtle diagnostic indicators embedded in the pulse. And absent such appreciation, which came only from prolonged training of their fingertips, they could never acquire the diagnostic acumen of their seniors, much less the great pulse readers of the day. Thus they cautioned students and young colleagues to avoid the instruments. It was only through “the habit of discriminating pulses instinctively” that the physician acquired “valuable truths . . . which he can apply to practice.” So inveighed the pioneering British physiologist John Burdon-Sanderson in 1867. His judgment was shared by a generation of senior British and American clinicians for whom the trained finger remained a more reliable measure of radial pulse than the sphygmograph’s arcane tracings. 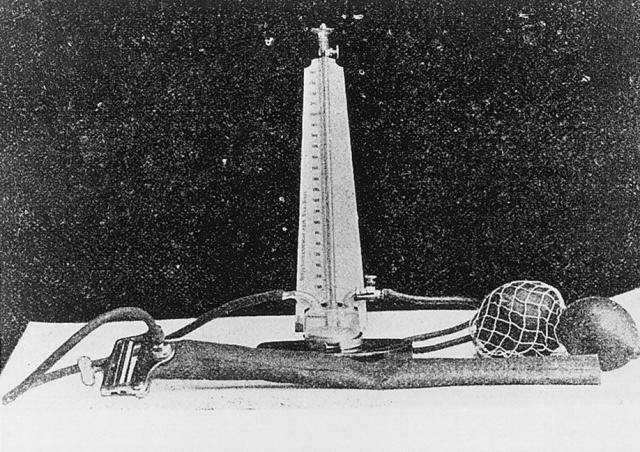 In The Pulse, his manual of 1890, William Broadbent cautioned his readers to avoid the sphygmograph, since interpretation of its tracings could “twist facts in the desired direction.” Physicians should “eschew instrumental aids and educate the finger,” echoed Graham Steell in The Use of the Sphygmograph in Medicine at the century’s close. Why did Mackenzie come to feel this way? The problem with the stethoscope was that the auscultatory sounds it “discovered,” while diagnostically illuminating, could cloud clinical judgment and lead to unnecessary treatments, including draconian restrictions of lifestyle. For Mackenzie, sphygmomanometers were essentially educational aids that would corroborate what medical students were learning to discern through their senses. And, of course, he allowed for the importance of such gadgetry in research. 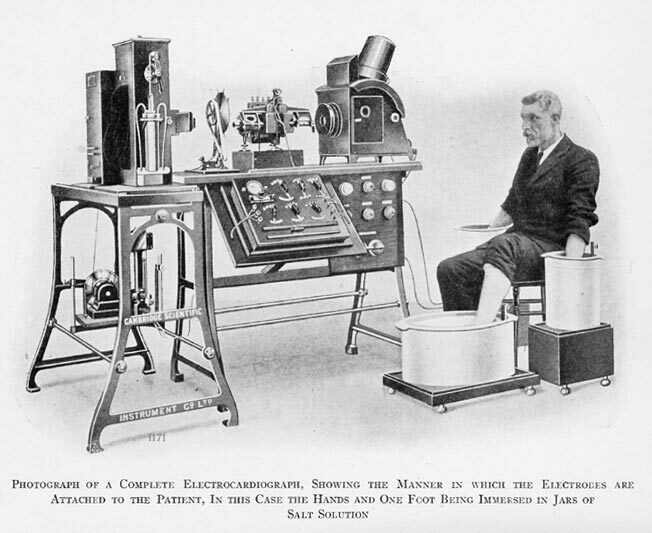 His final refinment of pulse-reading instrumentation, the ink jet polygraph of 1902 (see sidebar), was just such a tool. But it was never intended for generalists, whose education of the senses was expected to be adequate to the meaning of heart sounds. 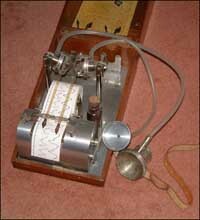 Nor was Mackenzie a fan of the EKG, when it found its way into hospitals after 1905. He perceived it as yet another “new toy” that provided no more diagnostic information than the stethoscope and ink jet polygraph. And for at least the first 15 years of the machine’s use, he was right. Now, of course, the stethoscope, the sphygmomanometer, and, for adults of a certain age, the EKG machine are integral to the devalued art of physical examination. Critics who bemoan the overuse of CT scans and MRIs, of echocardiography and angiography, would be happy indeed if medical students and residents spent more time examining patients and learning all that can be learned from stethoscopes, blood pressure monitoring, and baseline EKGs. But more than a century ago these instrumental prerequisites of physical examination and diagnosis were themselves new toys, and educators were wary of what medical students would lose by relying on them at the expense of educating their senses. Now educators worry about what students lose by not relying on them. Toys aside, I too hope that those elements of physical diagnosis that fall back on one tool of exquisite sensitivity – the human hand – will not be lost among reams of lab results and diagnostic studies. One shudders at the thought of a clinical medicine utterly bereft of the laying on of hands, which is not only an instrument of diagnosis but also an amplifier of therapy. The great pulse readers of the late nineteenth century are long gone and of interest only to a handful of medical historians. Will the same be true, a century hence, of the great palpators of the late twentieth? I worked as Dr. Silen’s editor in 2000-2001, during which time I was privileged to read his unpublished lectures, addresses, and general-interest medical essays as preparation for helping him organize his memoirs. Sadly, the memoirs project never materialized. In this paragraph, I am guided especially by two exemplary studies, Christopher Lawrence, “Incommunicable Knowledge: Science, Technology and the Clinical Art in Britain, 1850-1914,” J. Contemp. Hist., 20:503-520, 1985 and Hughes Evans, “Losing Touch: The Controversy Over the Introduction of Blood Pressure Instruments in Medicine, “ Tech. Cult., 34:784-807, 1993. Broadbent and Steell are quoted from Lawrence, p. 516. R. McNair Wilson, The Beloved Physician: Sir James Mackenzie (New York: Macmillan, 1926), pp. 103-104. A more recent, detailed account of Mackenzie’s life and career is Alex Mair, Sir James Mackenzie, M.D., 1853-1925 – General Practitioner (London: Royal College of General Practitioners, 1986). Beginning in the 1980s, primary care educators, concerned that newly trained family physicians, freighted with technology and adrift in protocols, lacked people skills, resuscitated an expression coined by the British psychoanalyst Enid Balint in 1969. They began promoting “patient-centered medicine,” which, according to Balint’s stunning insight, called on the physician to understand the patient “as a unique human being” (J. Roy. Coll. Gen. Practit., 17:269, 1969). More recently, patient-centered medicine has evolved into “relationship-centered care” (or “patient and relationship-centered care” [PRCC]) that not only delineates the relational matrix in which care is provided but also extols the “moral value” of cultivating doctor-patient relationships that transcend the realm of the biomedical. In language that could just as well come from a primer of relational psychotherapy, these educators enjoin clinicians to embrace the clinician-patient relationship as “the unique product of its participants and its context,” to “remain aware of their own emotions, reactions, and biases,” to move from detached concern to emotional engagement and empathy, and to embrace the reciprocal nature of doctor-patient interactions. According to this latter, the clinical goal of restoring and maintaining health must still “allow[ing] a patient to have an impact on the clinician” in order “to honor that patient and his or her experience” (J. Gen. Int. Med., 21:S4, 2006). Recent literature on relationship-centered care evinces an unsettling didacticism about the human dimension of effective doctoring. It is as if medical students and residents not only fail to receive training in communication skills but fail equally to comprehend that medical practice will actually oblige them to comfort anxious and confused human beings. So educators present them with “models” and “frameworks” for learning how to communicate effectively. Painfully commonsensical “core skills” for delivering quality health care are enumerated over and over. The creation and maintenance of an “effective” doctor-patient relationship becomes a “task” associated with a discrete skill set (e.g., listening skills, effective nonverbal communication, respect, empathy). A recent piece on “advanced” communication strategies for relationship-centered care in pediatrics reminds pediatricians that “Most patients prefer information and discussion, and some prefer mutual or joint decisions,” and this proviso leads to the formulation of a typical advanced-level injunction: “Share diagnostic and treatment information with kindness, and use words that are easy for the child and family to understand” (Pediatr. Ann., 4:450, 2011). Other writers shift the relational burden away from caring entirely and move to terrain with which residents and practitioners are bound to be more comfortable. Thus, we read of how electronic health records (EHRs) can be integrated into a relational style of practice (Fam. Med., 42:364, 2010) and of how “interprofessional collaboration” between physicians and alternative/complementary providers can profit from “constructs” borrowed from the “model” of relationship-centered care (J. Interprof. Care., 25:125, 2011). More dauntingly still, we learn of how relational theory may be applied to the successful operation of primary care practices, where the latter are seen as “complex adaptive systems” in need of strategies for organizational learning borrowed from complexity theory (Ann. Fam. Med., 8S:S72, 2010). There is the sense that true doctoring skills (really the human aptitude and desire to doctor) are so ancillary to contemporary practice that their cultivation must be justified in statistical terms. Journal readers continue to be reminded of studies from the 1990s that suggest an association between physicianly caring and the effectiveness and appropriateness of care, the latter measured by efficiency, diagnostic accuracy, patient adherence, patient satisfaction, and the like (Pediatr. Ann., 40:452, 2011; J. Gen Intern. Med., 6:420, 1991; JAMA, 266:1931, 1991). And, mirabile dictu, researchers have found that physicians who permit patients to complete a “statement of concerns” report their patients’ problems more accurately than those who do not; indeed, failure to solicit the patient’s agenda correlates with a 24% reduction in physician understanding (J. Gen. Int. Med., 20:267, 2005). The problem, as I observed in The Last Family Doctor, is that contemporary medical students are rarely drawn to general medicine as a calling and, even if they are, the highly regulated, multispecialty structure of American (and to a somewhat lesser extent, Canadian) medicine militates against their ability to live out the calling. So they lack the aptitude and desire to be primary caregivers – which is not the same as being primary care physicians – that was an apriori among GPs of the post-WWII generation and their predecessors. Primary care educators compensate by endeavoring to codify the art of humane caregiving that has traditionally been associated with the generalist calling – whether or not students and residents actually feel called. My father would probably have appreciated the need for a teachable model of relationship-centered care, but he would also have viewed it as a sadly remedial attempt to transform individuals with medical training into physicians. Gifted generalists of his generation did not require instruction on the role of the doctor-patient relationship in medical caregiving. “Patient and relationship-centered care” was intrinsic to their doctoring; it did not fall back on a skill set to be acquired over time. The PRCC model, however useful in jump-starting an arrested doctoring sensibility, pales alongside the writings of the great physician-educators of the early twentieth century who lived out values that contemporary educators try to parse into teachable precepts. For medical students and primary care residents, I say, put aside the PRCC literature and introduce them ab initio to writings that lay bare what Sherwin Nuland terms “the soul of medicine.” I find nothing of practical significance in the PRCC literature that was not said many decades ago – and far more tellingly and eloquently – by Francis W. Peabody in “The Care of the Patient” (JAMA, 88:877, 1927), L. J. Henderson in “Physician and Patient as a Social System (NEJM, 212:819, 1935), W. R. Houston in “The Doctor Himself as a Therapeutic Agent” (Ann. Int. Med., 11:1416, 1939), and especially William Osler in the addresses gathered together in the volume Aequanimitas (1904). Supplement these classic readings with a healthy dose of Oliver Sacks and Richard Selzer and top them off with patient narratives that underscore the terrible cost of physicians’ failing to communicate with patients as people (such as Sacks’s own A Leg to Stand On  and David Newman’s powerful and troubling Talking with Doctors ), and you will have done more to instill the principles of patient and relationship-centered care than all the models, frameworks, algorithms, communicational strategies, and measures of patient satisfaction under the sun.